In light of recent Hollywood events, Formula 1 has stepped forward to announce that they will no longer be entertaining the use of ‘Grid girls’ in its events. Stating that “Grid girls will no longer be used by Formula 1 from the start of the 2018 World Championship season.” Sean Bratches, managing director of the events commercial operations stated that the changes were a move designed to make the events in tune with its new vision for the sport. However, it comes as no surprise as F1’s own managing director announced on Radio 5 earlier in the year that the use of female promotion was ‘under Review’. However, the decision does not sit well with everyone and the move has been an extremely controversial one with the models themselves. Ex-grid girl Penny Sturges criticised the decision stating that grid girls enjoyed the line of work. She described being a grid girl as more ‘family’ than work. She also expressed that she fears many other jobs involving promotional women will come under fire in the future as a result of the decision. 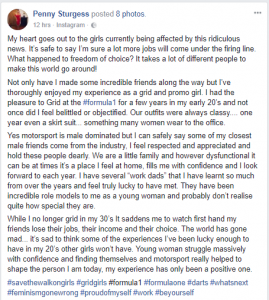 In addition to this, Caroline Hall, former grid girl and owns modeling agency told 5 live she believed F1 has taken extreme measures in a very short amount of time. 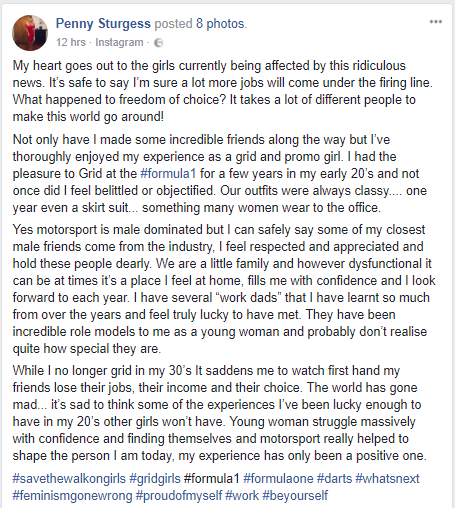 She suggested that as an alternative, they should have looked at the possibility of modernizing grid girls roles rather than strictly abolishing them.